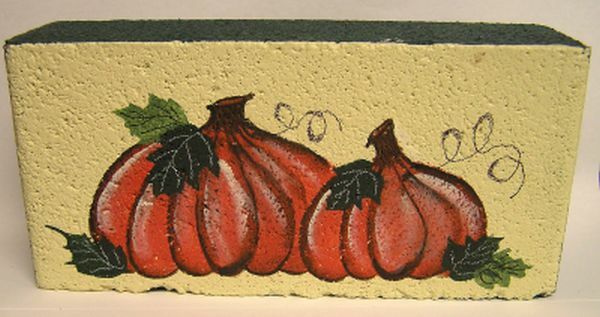 Our original design hand painted brick features two pumpkins, leaves, and twisted vines. It can be personalized on top with whatever you would like. 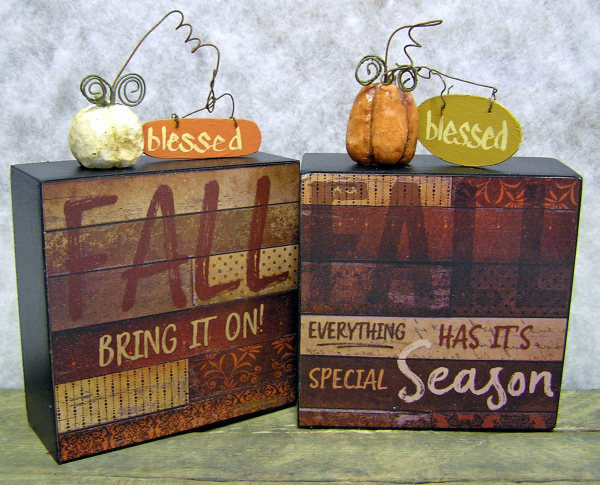 These wooden box signs come in three styles: "Find the Blessing in Everything" (shown), "FALL Bring It On", and "FALL Everything Has It's Special Season" (click on photo to see these options). 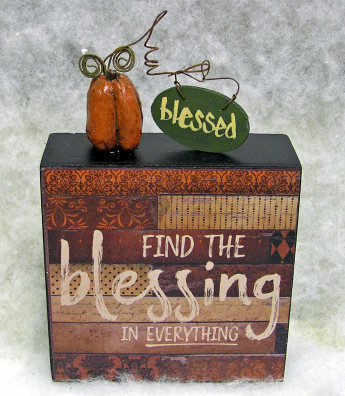 They have a pumpkin on top with wire vines and a sign that says "blessed". They measure 6 x 4 x 1 1/2. "SO MUCH TO BE THANKFUL FOR" is engraved on this resin sign. 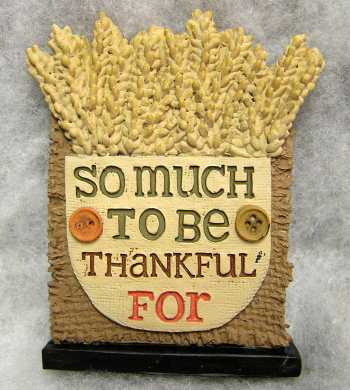 It has a burlap look bag with wheat coming out of it, little buttons on the sign, and is sitting on a black base. It measures 4 x 3 x 3/4. 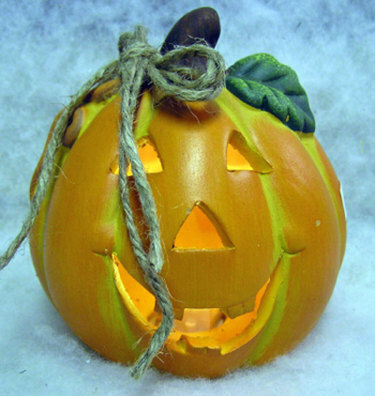 This ceramic pumpkin is a battery operated light. He has a big cut out smile, cut out nose and eyes and a jute bow on top. The batteries are included. It measures 5 x 4 1/2 x 4 1/2. 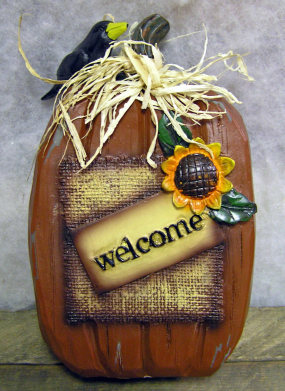 "Welcome" is printed on the front of this ceramic pumpkin. It has a burlap look square with a sunflower, crow, and raffia bow. It measures 7 1/2 x 4 1/2 x 2. 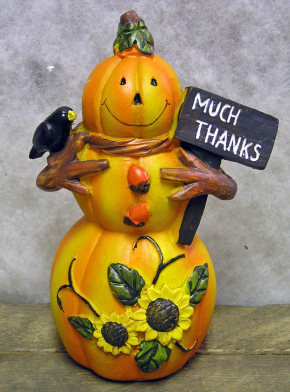 These ceramic pumpkin men come in two styles: "Much Thanks" Pumpkin Man (shown) and Grapes/Corn Pumpkin Man (click on photo to see this option). 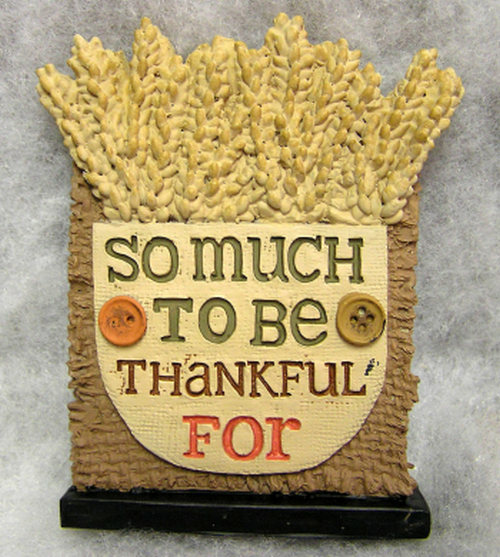 The one shown is carrying a sign that says "MUCH THANKS" and has a crow, sunflowers, and twig arms. 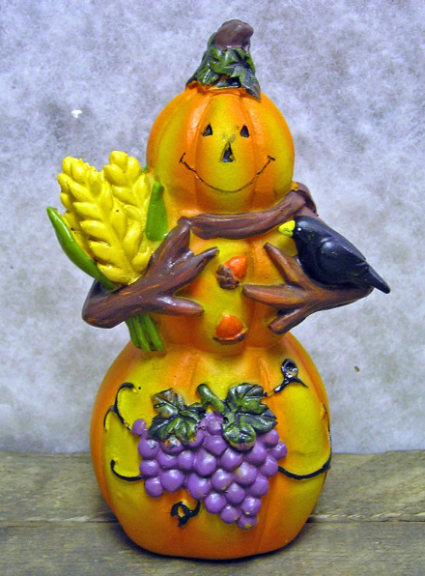 The other pumpkin man has grapes on his body and is carrying corn and a crow with his twig arms. They measure 5 x 3 x 2 1/2. 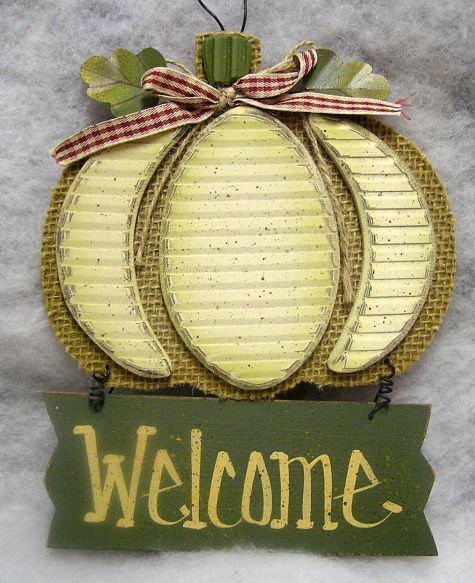 This hand painted fall sign features a cornucopia with pumpkin with raffia bow, apple with checked fabric leaves, and corn. 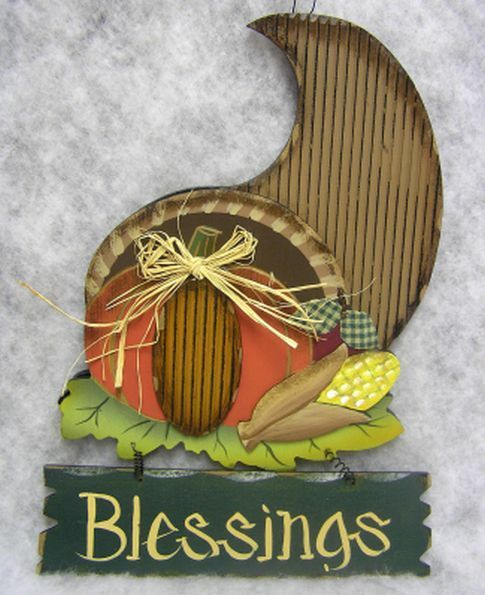 It has a sign that says "Blessings" hanging at the bottom. It measures 15 x 10 x 1. 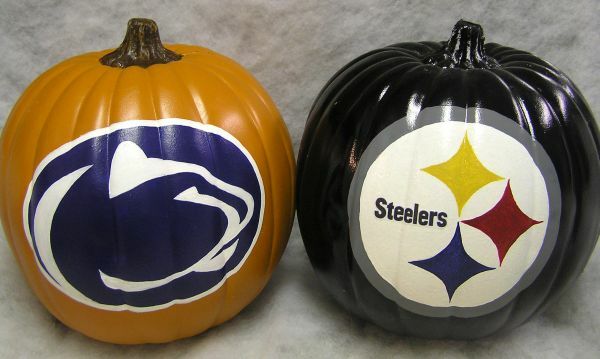 These unique artificial pumpkins are hand painted with football team logos. 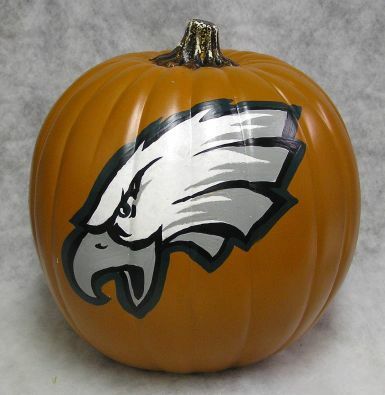 They are available in four styles as well as in orange and black: Philadelphia Eagles (shown), Penn State, Baltimore Ravens and Pittsburgh Steelers (click on photo to see PSU and Steelers options). They measure 10 X 8 X 8. "Welcome" is hand painted and flyspecked on the sign that hangs at the bottom of this wooden item. 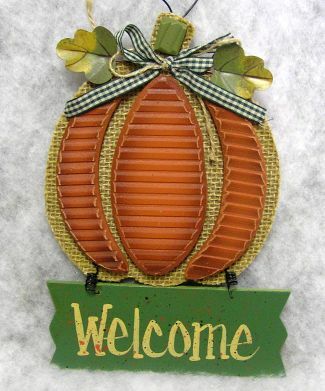 The top part is a pumpkin with some burlap sections, jute and ribbon bow, and metal hanger. It comes in orange (shown) or cream (click on photo to see this option). It measures 9 x 6 x 3/4. 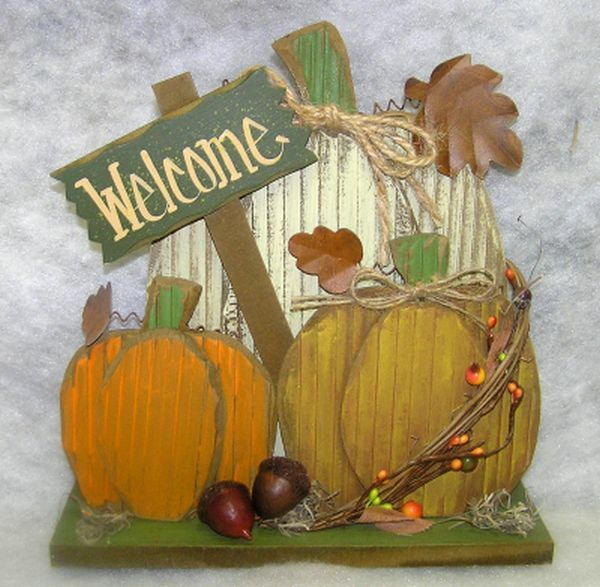 This unique wooden fall item features a variety of pumpkins with metal leaves and wire vines, a wooden fence, and a scarecrow with burlap dress and plaid shirt. 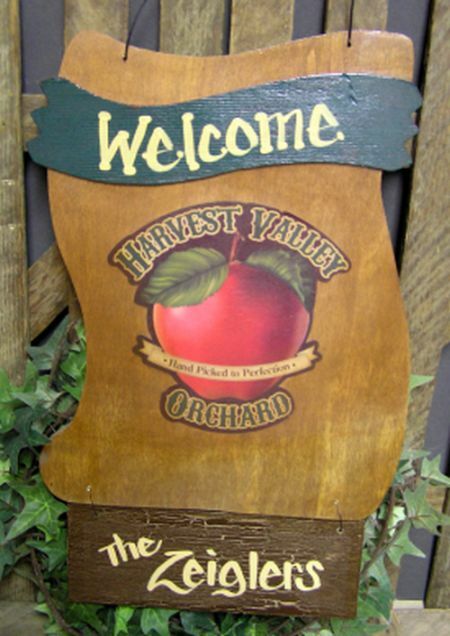 There are two hand painted signs that say "Welcome Friends". It measures 6 x 17 x 1 1/2. This Manchester Cottage design features three wooden pumpkins in different colors, metal leaves, curled wire vines, twigs and berries, and acorns. It has a sign that says "Welcome" and sits on a wooden base. It measure 10 1/2 x 10 x 3. This resin fall angel features metal leaf wings, a bowl of fruit, and a pumpkin at her feet. 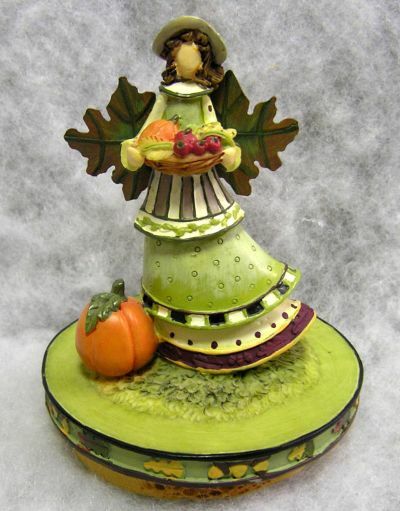 She can be used as a candle topper or a beautiful decoration. It measures 4 1/2 x 3 1/2 x 3 1/2. 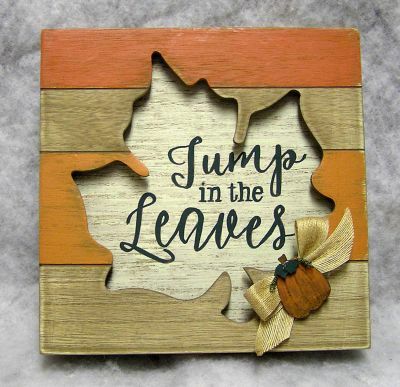 This unique wooden box features a leaf cut out with "Jump in the Leaves" hand painted in the center. It also has a burlap bow with a rusty painted pumpkin. It measures 9 1/2 x 9 1/2 x 1.